An extinction-level asteroid, 213 Astraea, is cannonballing toward Earth. Collision, imminent. An international team of scientists is working around the clock to avert the cataclysm—few are optimistic. World governments are preparing for impact with deep earth bio-dome bunkers, but only a select few lottery winners will be saved. Still, there might be a way for him to survive Astraea: a slim chance, requiring a radical leap of faith. 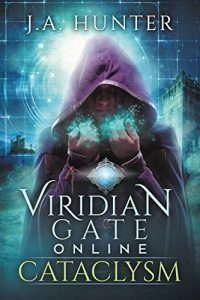 Through a connection at Osmark Technologies, Jack’s acquired a NexGenVR capsule and with it, a one-way ticket to the brand-new, ultra-immersive, fantasy-based VRMMORPG, Viridian Gate Online. Taking that leap of faith, though, means permanently trapping his mind in the game, killing his body in the process. Worse, one in six die during the transition, and even if Jack beats the odds, he’ll have to navigate a fantastical world filled with vicious monsters, domineering AIs, and cutthroat players. And when Jack stumbles upon a secret conspiracy to sell off virtual real estate to the ultrawealthy—transforming V.G.O. into a new feudal dark age—the deadly creatures inhabiting Viridian Gate’s expansive dungeons will be the least of his concerns.